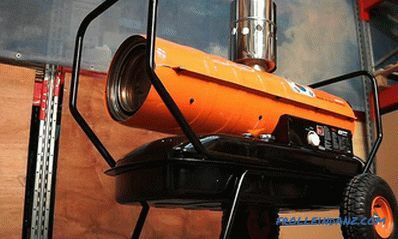 Very often, the developments of military technology come into our life tightly. Where did you find this article? In a search engine, for this using the Internet. It is interesting that initially this network was developed by the DARPA agency for communication of soldiers and transfer of secret information. Camouflage coloring, which is now present on a large number of cars was also invented to disguise during reconnaissance missions. 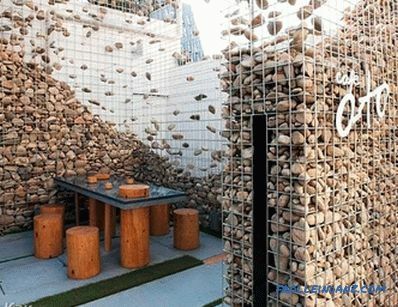 In almost the same way, gabions reached us. 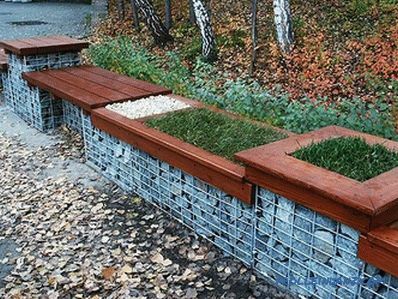 Speaking simply, then gabions are boxes made from a metal grid that are filled with various elements. The word came to us from French and literally translates as "basket". Such constructions take their origin from the fighting, when it was necessary to organize a circular defense during the firing. By the way, then they were made of intertwined willow branches and filled with earth. 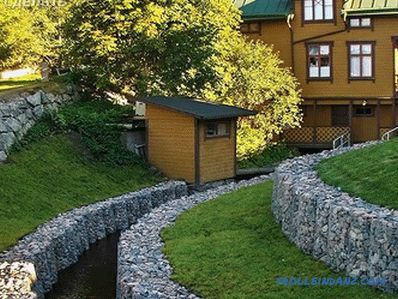 Today, gabions are used to strengthen walls, hillsides, roads, shores, or slopes. They provide an opportunity to prevent landslides and eliminate erosion. 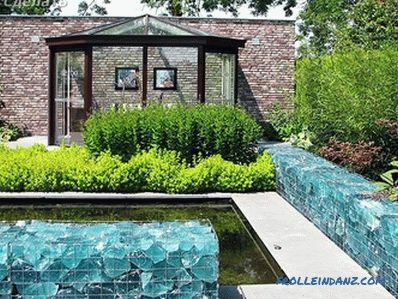 But the special turns of this kind of elements received in landscape design. 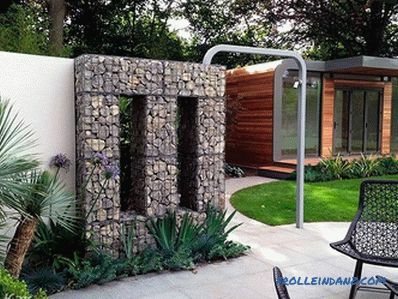 In this article, you will learn more about how gabions are used in landscape design. In all cases you need to know some details about the sizes. Weight and connection method impose some restrictions. For example, rectangular in length cannot exceed 6 m, in width - 2, and in height - 1; cylindrical run no more than 4 m in length. This allows for the greatest strength and endurance regardless of the substrate. Mattresses can be very wide, but do not exceed 30 cm in height. These basic products combine to get the result of incredible attractiveness. Anything can be used as a filler. 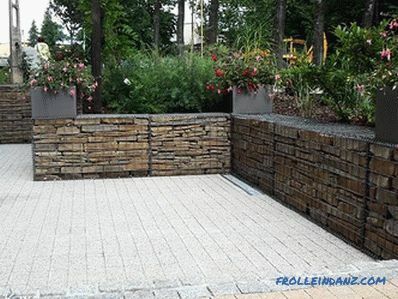 Natural stones look the most beautiful, but in order to achieve uniformity, artificial elements are also filled. 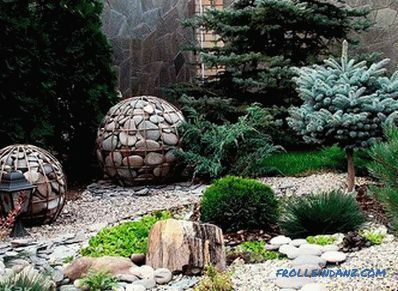 To save money, you can cheat and put the front part of a beautiful "savage" or pebbles, and cover the rest of the space with crushed stones. The quality and appearance of the design itself will not suffer, and no one will guess that there is a catch. If you have a fantasy, then do not confine yourself only to this method. Inside you can put logs of the same size and different diameters, you can beautifully pack glass bottles so that the bottoms are out, you can put a brick, cloth, and so on. 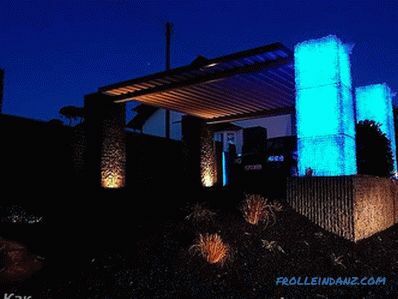 If you fill the entire space with glass elements, and between them lay the LED strip, you get a unique light for the tracks. If you have a private house, then you, of course, want to build a plot near it so that all the neighbors are jealous. 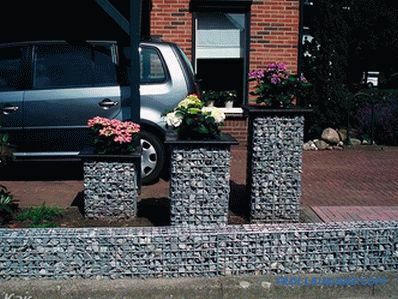 Someone plants a large number of flowers, someone sows lawns, but we suggest that you use gabions along with all this. 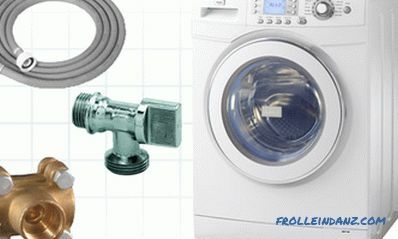 You may argue that such products look very clumsy, but we will disagree with you and see why. Something natural looks much more pleasant as a hedge. Many are tired of metal fences and partitions. 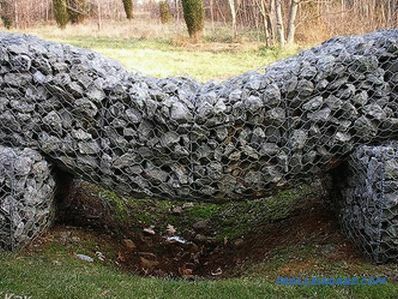 That's just in such a case and fit gabion. It is important to remember that rectangular structures have certain size limits. Not everyone wants its construction to be 2 m deep. Interesting constructions have been developed for such cases that will not take up so much space. Two elements are combined, leaving a small space between them (about 10 cm) and firmly connecting. 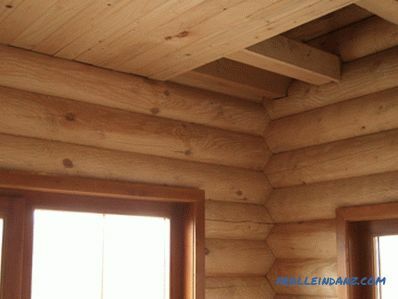 In order to provide support, the entire length of the pillars are placed, which are made in a similar way. The whole thing will not be sustained without a sound basis. It is best to dig a trench to 30 cm and tamp screening with sand.With this arrangement, you can achieve a greater height with a smaller width. 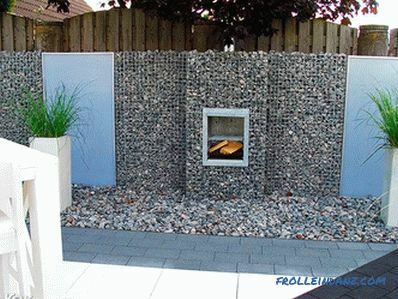 The gabion filler does not have to be homogeneous if you add glass in some places inserts, then in the afternoon, the light, passing through them, will create a pleasant atmosphere of tranquility. It is pleasant when there is a small reservoir in the garden, it is good if it is of natural origin, but not everyone is so lucky. 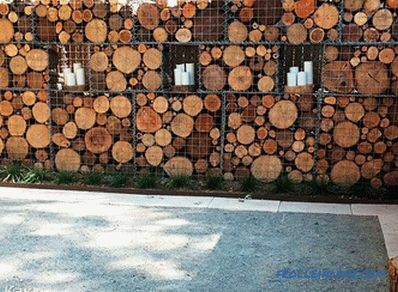 And this is where gabions-mattresses come in handy. You can do in two ways. The first - a reservoir that will be drowned in the ground. For this, a structure of stones and wires is laid on the bottom. 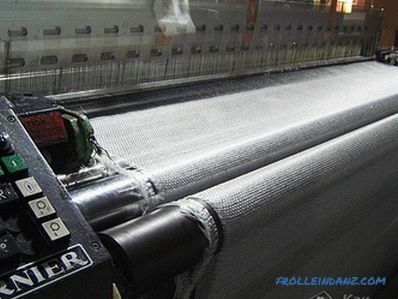 As a binding material, it is better to choose rods that will be coated with plastic of the appropriate color so as not to stand out and not be exposed to corrosion. 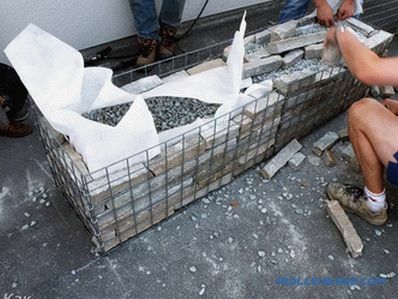 With this method of laying you can combine several types of gabions. 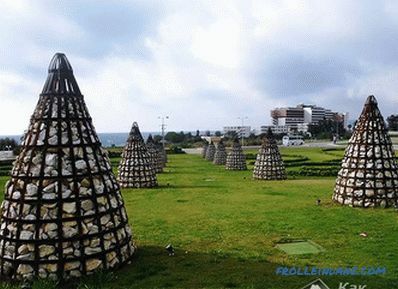 For example, the main area can be formed from mattresses, and the edges - from cylinders, thus it is possible to avoid erosion of the coast and get a pleasant rounded shape. Well, if the role of the filler will be large pebbles. The macropores pass the liquid well, so the sludge will not accumulate and clog the bottom. If you do not want to dig a hole, then everything can be done much easier. 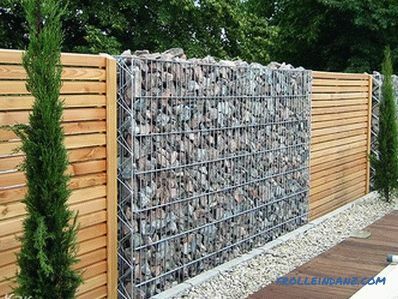 Take a certain container of plastic or other material, install it, and put a gabion along the perimeter. It will close the tank and give the pond a more natural look. The advantage of this method is that if you wish, you can change its location. If you like to enjoy delicious food in nature, then do not do without a table. What is the best material for it? Plastic looks unnatural, the sun can crack and become fragile. Wood is beautiful and natural, but how long will such a table last? 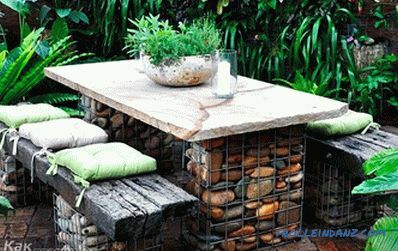 Why not make a table out of gabion? Select the elements of the required size, select the location for their location and install. 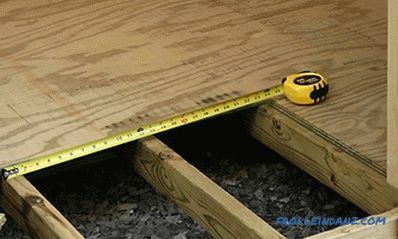 From above you can lay the tabletop, let it be removable, so that in the winter or in bad weather to take it into the house. Its size should exceed the substrate, so that there is a small protrusion for convenient placement of the knees. Do you want to install a fountain or some kind of sculpture? 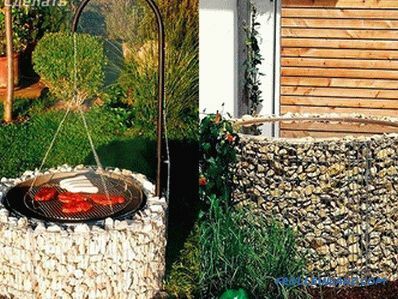 Why not make a pedestal for them from gabions. Renault mattresses are perfect here. By the way, in the same way you can perform a small platform, which then put a gazebo. This will avoid flooding during heavy rainfall, and thus extend the service life of the wood, and the soil below will not be washed away. Especially in rainy weather, you can safely enjoy the sound of falling drops, without fear of getting wet. How neater are the flowerbeds, which have clear outlines? And here again will come to the aid of our favorite design. You can drown her a little, and in the middle of the landing to organize. Or you can just put on the perimeter. Thus, all plants will remain intact and will not be trampled by animals or people. 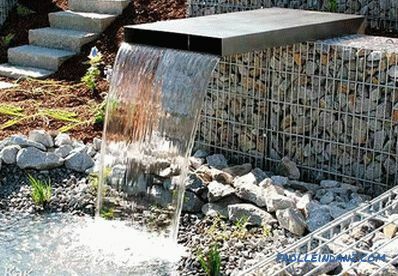 If you have your own well, then it can be made not just a source of water, but also a subject of decor and art. 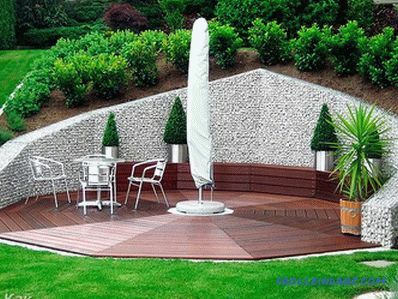 A conventional concrete ring doesn’t fit so well into the environment, so you can give it a more interesting look. Just pull the net so that its diameter at a certain step is different from the diameter of the ring - 15-20 cm - and carefully put inside any filler. Above you can leave a small area for the ground, in which you can then plant curly flowers. Their watering will not take much time - they got a bucket of water and at the same time got the plants drunk. To avoid messing with laying the paths, where you have to pick up every pebble, pour base and wait for the whole thing to be ready, take mattress products of small height and width, just put them in the right places. 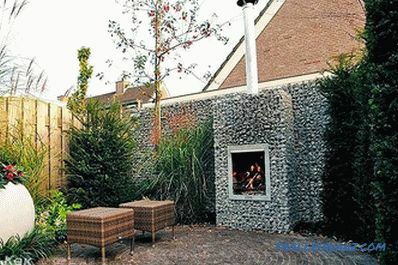 To make it look much more aesthetic, make a moderate groove and place gabions in it. The edges will not crumble and creep away and such trails will last a very long time. At the base you can plant flowers, which will give a particularly nice appearance. 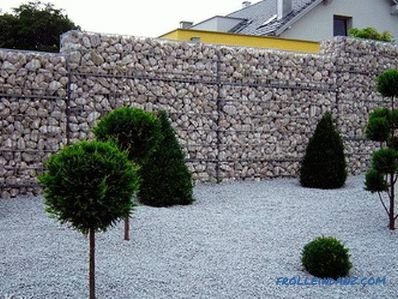 Probably, you have already noticed that gabions have a simple structure, so they can be made independently, without spending money on factory products. The advantage of this approach is that you select the exact shape and size that will be relevant specifically for your conditions. First you need to decide what you want to achieve: it will be a supporting structure, a structure for strengthening, or it will be just a decorative element. If you are definitely established with your desires, then it's time to choose a material. For supports it is best to use steel rods.Arrange them in the form of a grid and firmly tie all the intersections with steel wire, if possible, then use the best welding machine. Thus, make several grids and join them in the form of a box, fasten them together and fill them, then assemble them in the required place. If the design will carry a purely decorative target, then there is several ways to perform. You can purchase a netting net which will be covered with a protective layer. Further, it is necessary to precisely measure out the required size of a single piece, to stretch a steel wire on top and bottom along the entire base for stability and to fix the bottom well. After that, you need to give the desired shape, inside, install the pegs-support from the rods and drive them into the ground, then - carefully pour the filler and tamp it down. Thus, it is possible to wrap flowerpots, flower beds, trees and other elements around the perimeter. If there is a need, the upper part can be closed, but you can leave it as it is. For the same purpose, and suitable mesh of another kind, which is made using spot welding. In it, the cells have a regular rectangular shape, which looks much neater. For such a grid will not need to apply a wire around the entire circumference to secure it. 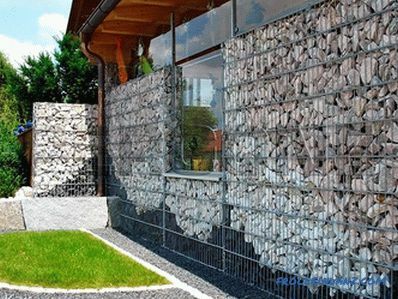 The life span of industrial gabions can reach 100 years. This means that for almost a lifetime it will be possible to forget about upgrading or caring for the structure. It does not matter what the bottom of the soil is, because the stones will provide excellent support for everything that will be on top. If you don’t really like the look of bare products, then pour them on top of the ground and plant plants, the flowers usually have no deep roots, so they will take root well. Do not dwell only on those options that you read about in this article. Connect your imagination - make an amphitheater, lay out a pool, make supports for the steps on the second floor, build a pyramid in your garden. Build the stage and give concerts to your home and neighbors. The main thing is never cease to develop and create.